Are the Cardinals ready to take charge? Can the Rams finally get their offense going? Do the 49’ers have all the right tools to win it all? Are the Seahawks a one year wonder? Time to look at, what is without question, the strongest division in the NFL: the NFC West Division. Free Agency: OT Jared Veldheer (Raiders) is the big prize as he should be a mainstay for years, and OG Ted Larsen (Buccaneers) adds quality depth. LB Ernie Sims (Cowboys) & CB Antonio Cromartie (Jets) are fine veteran additions to an already strong defense. RB Jonathan Dwyer (Steelers), TE John Carlson (Vikings) & WR Ted Ginn (Panthers) add quality depth for the offense. Draft: Washington State SS Deone Bucannon was an overlooked Safety in the draft, and he should pay off handsomely. Notre Dame TE Troy Niklas has great versatility as well as great size. North Carolina DE Kareem Martin has tremendous upside & Alabama DE Ed Stinson is a fine late pick. Pittsburg State WR John Brown adds speed & Virginia Tech QB Logan Thomas could be the future of the Cardinals. Overview: Head Coach Bruce Arians quietly did a splendid job last year. The question now is, can he get the Cardinals back to the playoffs? Bolstering the O-Line is a big help for QB Carson Palmer. The defense took a big hit when LB Daryl Washington was suspended for the season, but the Cardinals are strong enough to overcome the loss. The offseason moves by the Cardinals have put them in a good position to reach the postseason. Now they must deliver. Free Agency: QB Shaun Hill (Lions) gives the Rams a veteran to step in if needed. OG Davin Joseph (Buccaneers) also adds a veteran presence on the line. Unspectacular WR Kenny Britt (Titans) is looking for redemption. Re-signing OL Rodger Saffold was key. Draft: Auburn OT Greg Robinson brings much excitement to the O-Line as he should anchor the line for years. Pittsburgh DT Aaron Donald adds more ferocity to an already strong D-Line. Florida State DB LaMarcus Joyner lacks size but has great versatility. Auburn RB Tre Mason adds good depth for the running game, and DB’s Mo Alexander of Utah State & E.J. Gaines of Missouri are good late picks. Overview: It’s now or never for QB Sam Bradford. He has a lot of youth playing with him and he has to show that he is the man. The defense is formidable, and if the offense can finally compliment that side, the Rams could become dangerous. Free Agency: SS Antoine Bethea (Colts) & CB Chris Cook (Vikings) help offset the losses of other veteran players in the secondary. The re-signing of WR Anquan Boldin & DB Eric Wright were wise moves. Draft: Northern Illinois SS Jimmie Ward is an odd pick as he could have been had later in the draft. Ohio State RB Carlos Hyde is being looked at as the future of the running game. USC C Marcus Martin is a future starter & Wisconsin LB Chris Borland is a tackling machine. South Carolina WR Bruce Ellington will add good depth. Overview: The 49’ers were oh so close to returning to the Super Bowl last year, and have now retooled with hopes to getting back there. They’ve shown confidence in QB Colin Kaepernick by rewarding him with an enormous contract. RB Carlos Hyde will eventually take over for aging RB Frank Gore, and the acquisition of Bills WR Stevie Johnson, might just be the one move that puts the offense over the top. Free Agency: DT Kevin Williams (Vikings) is the biggest name to join the team, as he tries to get to a Super Bowl. OG Stephen Schilling (Chargers) & CB Phillip Adams (Raiders) add depth. The re-signing of DE Michael Bennett & LB O’Brien Schofield was key. Draft: Having to wait until the 2nd round to pick, the Seahawks landed Colorado WR Paul Richardson, who could be an immediate impact. Missouri OT Justin Britt is a tremendous reach, but UCLA DE Cassius Marsh could flourish in this defense. Alabama WR Kevin Norwood is a solid pick. Overview: The Seahawks are feeling the aftereffects of winning a championship, as plenty of free agents bolted for greener pastures. Brandon Browner, Red Bryant, Chris Clemons, Kellen Davis, Golden Tate, Walter Thurmond, Chris Maragos, Paul McQuistan & Breno Giacomini are all gone. That’s a lot to overcome, especially with the added pressure of being the defending champions in the toughest division in the league. Nevertheless, the Seahawks are a very tough team and are looking to repeat, as a good portion of their offense remains intact, and that their secondary is tops in the league. Will the Bills end their eternal playoff drought? Can the Dolphins put last year’s off field distractions behind them? Do the Patriots have another Super Bowl appearance left in them? Do the Jets finally have the right QB leading them? It’s time to look at the offseason of the AFC East Division. DISCLAIMER: The writer of this article is a Bills fan. Free Agency: The Bills had to address their porous run defense and they did that by signing run stuffing LB Brandon Spikes (Patriots). Veteran CB Corey Graham (Ravens) adds great depth to the secondary. Unspectacular former first rounders LB Keith Rivers (Giants) & OG Chris Williams (Rams) fill needs, and RB Anthony Dixon (49’ers) looks to surprise. Draft: The Bills made the boldest move of the draft by trading up to grab Clemson WR Sammy Watkins, the premiere WR in this year’s draft. Standout OT Cyrus Kouandjio from Alabama fell to the Bills in the 2nd round. Louisville LB Preston Brown looks to be an old school 3-down player, while Duke CB Ross Cockrell was an under-the-radar player, and Baylor OG Cyril Richardson & Miami, FL OT Seantrel Henderson could be steals. Overview: The last member of the “League of Fools”, Bills owner Ralph Wilson Jr., passed away earlier this year. With that the front office is scrambling to field a winning team and end the Bills 14 year playoff drought, before a new owner takes over. The Bills weren’t just trading draft picks during the draft, as they traded away veteran WR Stevie Johnson to the 49’ers and acquired RB Bryce Brown from the Eagles. Prior to the draft, the Bills obtained Buccaneers WR Mike Williams, via trade. In addition, the Bills added former Lions head coach Jim Schwartz to be their new defensive coordinator, so you can see that the Bills are doing all that they can to become winners. But all eyes are on QB E.J. Manuel, who must stay healthy and must prove that he can be the leader the Bills need. Losing rookie phenom LB Kiko Alonso for the season, due to a knee injury, was a tough blow. Free Agency: An overhaul on the O-Line was needed for the Dolphins as they added OT’s Branden Albert (Chiefs) & Jason Fox (Lions). CB Cortland Finnegan (Rams) & FS Louis Delmas (Lions) add great experience to the secondary and NT Earl Mitchell (Texans) could be a mainstay for years to come. RB Knowshon Moreno (Broncos) gets a chance to shine without Peyton Manning, and OG Darryn Colledge (Cardinals) adds depth. Draft: Tennessee OT Ja’Wuan James was a bit of a reach in the first round, but he has good potential. The other WR from Louisiana State, Jarvis Landry is a solid pick. North Dakota State OT Billy Turner needs to refine his game, but he is one to keep an eye on. Liberty CB Walt Aikens is an exciting small school talent, Georgia TE Arthur Lynch is a throw-back Tight End that will help with receiving and blocking, and Montana LB Jordan Tripp is a definite project with a future. Overview: The Dolphins want to put everything that happened last year behind them, and so far they have done a very good job of it. Now they are tasked with getting over the stigma of being an average team. The offense is loaded with talent, even if it is devoid of big names, and the defense is quietly a strength of this team. Consistency is the key to success for the Dolphins. Free Agency: CB Darrelle Revis (Buccaneers) is looking for redemption after a forgettable stint at Tampa Bay & CB Brandon Browner (Seahawks) adds youth. WR Brandon LaFell (Panthers) should provide a boost & veteran DE Will Smith (Saints) adds much needed pass rushing help. Draft: Florida DT Dominique Easley’s draft stock fell due to injury, but he does fill a need. Eastern Illinois QB Jimmy Garroppolo is a big reach in the 2nd round. Wisconsin RB James White is a good rotational player. Georgia Tech CB Jemea Thomas has good potential & Michigan WR Jeremy Gallon is the type of slot receiver the Patriots like to use. Overview: The loss of Brandon Spikes, Adrian Wilson & Aqib Talib can not be dismissed, even if the Patriots feel they have replaced them. As long as QB Tom Brady is in charge, the Patriots will be contenders. Once again the pressure is on the defense to get them back to the Super Bowl. Free Agency: QB Michael Vick (Eagles), RB Chris Johnson (Titans) & WR Erik Decker (Broncos). Those are some big names, but are they the right players? WR Jacoby Ford (Raiders) & OT Breno Giacomini were added for insurance. Draft: Louisville FS Calvin Pryor is a playmaker, something the Jets really need. Texas Tech TE Jace Amaro is more of a big WR, and will have to transition to a more traditional offense. Maryland CB Dexter McDougle was a bit of a reach, whereas Oklahoma WR Jalen Saunders is a good slot receiver. Furman OT Dakota Dozier is a good solid mid round pick. Overview: Another year, another QB for the Jets. This time veteran Michael Vick is tasked with getting the Jets to becoming winners. He does have help with Johnson & Decker, but Johnson is not the rusher he used to be, and Decker will soon find out that Vick is no Peyton Manning. Despite the big name signings by the Jets on offense, they more likely will once again have to rely on their strong defense to lift them to victory. Are the Bears Super Bowl bound? Will a new coach be the difference for the Lions? Can the Packers defense become a strength of the team? Let’s have a look at the offseason of the NFC North Division. Free Agency: An overhaul of the defense was in order, and that’s what the Bears did. The signing of young DE’s Lamarr Houston (Raiders) & Willie Young (Lions) are top notch moves. The Bears didn’t stop there as they also added FS Ryan Mundy (Giants) & SS Danny McCray (Cowboys) and veteran players such as SS Adrian Wilson (Patriots), LB Tim Dobbins (Texans) & DE Jared Allen (Vikings). The Offense was also addressed with the addition of C Brian De La Puente (Saints) and WR’s Domenik Hixon (Panthers) & Josh Morgan (Redskins). The combination of youth and veteran players gives the Bears exactly what they needed to become a strong team. Draft: Virginia Tech CB Kyle Fuller may not be the fastest player in the secondary but he adds a great physical presence that the Bears need. DT’s Ego Ferguson (Louisiana State) & Will Sutton (Arizona State) are not spectacular, but they won’t be asked to be day 1 starters. Minnesota FS Brock Vereen is a great 4th round pick & San Jose State QB David Fales becomes an intriguing player to watch in a very crowded position. Overview: Despite losing Julius Peppers, Devin Hester, Henry Melton, Corey Wooton, Major Wright & Josh McCown, the Bears have made improvements, and have fans clamoring for a Super Bowl appearance. Those dreams all lie with the performance of QB Jay Cutler, who has to be feeling the pressure of “It’s now or never.” Cutler has few excuses; with a reorganized defense, a good running game with Matt Forte, and one of the top WR duos in the NFL (Brandon Marshall & Alshon Jeffery), it is not difficult to see that the Bears should be strong contenders for the Super Bowl. Free Agency: WR Golden Tate (Seahawks) is now the compliment to WR Calvin Johnson. Whether he is up for the job remains to be seen. WR Naaman Roosevelt (Browns) was added as insurance. On defense, LB Darryl Tapp (Redskins) & SS James Ihedigbo (Ravens) are solid additions. Draft: North Carolina TE Eric Ebron gives the Lions a much needed extra weapon at this position, as Ebron is a much better receiver than blocker. Brigham Young LB Kyle Van Noy is a versatile player and could have an instant impact this season. Arkansas C Travis Swanson adds great depth with potential starting ability & Princeton DT Caraun Reid is a most intriguing project player. Overview: Former Colts offensive coordinator Jim Caldwell is now the man in charge of “Restoring the Roar” in Detroit. The Lions are a talented group, yet somehow have difficulty maximizing their true potential. If Caldwell can get the Lions to reach that point, watch out. Free Agency: The Packers had very little money to spend after re-signing B.J. Raji, James Starks, Matt Flynn & Sam Shields. Yet they were able to land veteran DE Julius Peppers (Bears), whom they are hoping will give them that extra push on defense. Draft: Alabama FS Ha Ha Clinton-Dix is not an exciting player, but he gets the job done, which is what the Packers need. Fresno State WR Davante Adams is a welcome fresh face to an aging receiveing corps, as are WR’s Jared Abbrederis from Wisconsin & Jeff Janis from Saginaw Valley State. Southern Mississippi DT Khyri Thornton is a project player that might have to learn fast. Overview: What more can head coach Mike McCarthy do with this team? The addition of Peppers will help, but other defensive players have to step up. CB Sam Shields was locked up, and as long as QB Aaron Rodgers is around, the Packers will still be contenders. Yet they are no longer the only good team in the division. Free Agency: DT Linval Joseph (Giants) & CB Captain Munnerlyn (Panthers) are great additions. The rest are less exciting. DT Corey Wootton (Bears), OG Vladimir Ducasse (Jets), LB Jasper Brinkley (Cardinals) & FS Kurt Coleman ( Eagles), give Vikings fans little to be thrilled about. Draft: UCLA LB Anthony Barr is a tremendous athlete, but comes with little experience at his position, making him a big risk. Louisville QB Teddy Bridgewater is the big story in this draft, as he appears to be the new heir apparent. Oregon State DE Scott Crichton was a late riser on draft boards due to his pass rushing skills. Stanford OG David Yankey could be a steal in the 5th round & Virginia Tech CB Antone Exum is a good late pick. Overview: Matt Cassell, Christian Ponder & Teddy Bridgewater. That is what the Vikings QB situation has turned into, and it is not much to get excited about. RB Adrian Peterson will have to get ready to be the offense again, as the WR group is solid, but not spectacular. The loss of DL Kevin Williams & Jared Allen, RB Toby Gerhart, & OT J’Marcus Webb will definitely be felt. Currently, the NFL is at a point where it has had enough of steroids in sports. They have started to crack down on performance enhancing drugs, and have increased the punishments for using these drugs. As shown with the yearlong suspension of Josh Gordon for marijuana issues, the NFL is willing to suspend big name players, and they do not care about the reactions from the fans, the teams, or the players. Recently, the NFL suspended yet another big name player – Philadelphia Eagles OT Lane Johnson. This suspension will last for four regular season games, and has forced the Eagles into a lot of unwanted attention. The loss of Johnson is only for four games; however, it will have a very huge impact on the eagles, and might even cost them a playoff position. Johnson is a fantastic player, and his loss will be felt. The job of the OT, as a member of the offensive line, is to block defenders and keep them away from the player that has the football. This can also include blocking players from getting to the quarterback, which is a huge part of Johnson’s role with the Eagles. Last season, Johnson was one of the most consistent players on the Eagles, and he only missed one snap on the entire season because of a very mild injury. Johnson was one of the most consistently blockers on the team, and his loss will really hurt the Eagles, especially QB Nick Foles. With the departure of QB Michael Vick, the Eagles have finally moved away from the running option offense that they have been using for the last few seasons. Now, with Nick Foles at the helm, they have become a pocket passing team. Last season, Foles was absolutely amazing as the starter of the Eagles, and he really made himself seem like a top 10 quarterback in the league. Much of this was due to the protection offered by Lane Johnson. Foles is a very, very talented passer, and the more time he has in the pocket, the better he plays. The Eagles have been known for focusing on the deep ball, and for this to work next season, Foles needs to have much more time in the pocket. With the loss of Johnson for four games, this will be an issue. For the first four weeks of the season in 2014, the Eagles are playing the Jacksonville Jaguars, the Indianapolis Colts, the Washington Redskins, and the San Francisco 49ers. Many of these teams have very strong defenses, and they will take many more opportunities to go for the sack with Johnson out of the lineup. 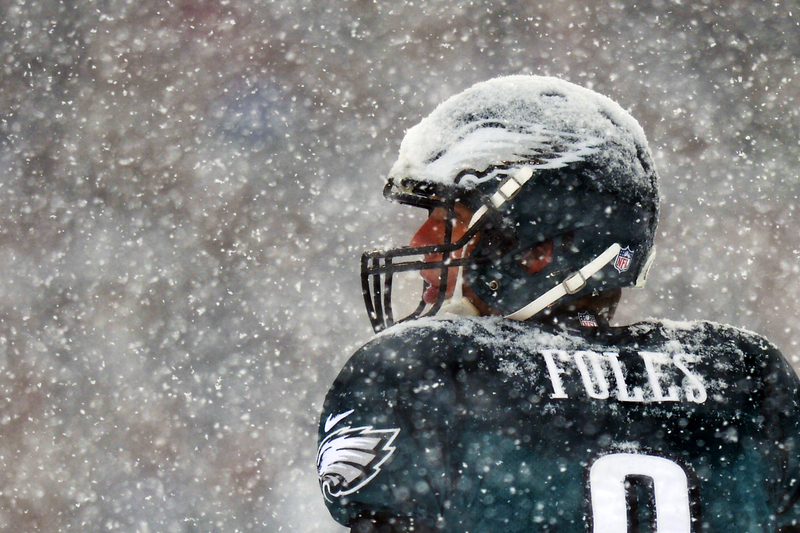 This can be very dangerous for Foles, and could even cost the Eagles a spot in the playoffs. The Eagles play in one of the most competitive divisions in the league. With the Eagles, New York Giants, Washington Redskins, and Dallas Cowboys in a single division, the NFC East is one of the hardest to actually pull away from the competition, and losing Johnson for four games could really cost his team some valuable wins. Are the Ravens ready to get back to their winning ways? Will head coach Marvin Lewis finally get a playoff victory for the Bengals? Can the Browns get out of mediocrity? Are the Steelers moving forward, backward or nowhere? Let’s look at the how the offseason went for the AFC North Division. Free Agency: Ageless WR Steve Smith (Panthers) adds a reliable deep threat that the Ravens are sorely lacking. TE Owen Daniels (Texans) & RB Justin Forsett (Jaguars) add quality depth. The Ravens did a good job re-signing several of their own free agents to help keep the team intact. Draft: Alabama LB C.J. Mosley was a wise pick, as he could become a permanent fixture for a long time. NT Timmy Jernigan & FS Terrence Brooks of Florida State will add valuable depth and potential starting ability in the future. Colorado State TE Crockett Gilmore is an old school/traditional type player that will help as both a blocker and receiver. Coastal Carolina RB Lorenzo Taliaferro adds more competition to a crowded backfield & Penn State OG John Urschel is a strong project. Overview: The Ravens went through a Super Bowl Championship hangover last year, but are now primed to become serious contenders again. Re-signing players like NT Terrence Cody, WR Jacoby Jones, OT Eugene Monroe & TE Dennis Pitta, emphasize how much the Ravens are willing to do to become one of the elite teams again. Free Agency: Veteran SS Danieal Manning (Texans) adds good depth & QB Jason Campbell (Browns) is a quality back-up. Unfortunately this is as good as it got for the Bengals, as salary cap issues prevented them from adding more talent. Draft: Michigan State CB Darqueze Dennard was a gem of a pick, that the Bengals could not have expected so late in the first round. Louisiana State RB Jeremy Hill will add power to the running game, and West Virginia DE Will Clarke adds youth to an already strong defense. Alabama QB A.J. McCarron is a project that many fans will be keeping an eye on. Overview: It’s now or never for QB Andy Dalton. He has the weapons on offense and the Bengals have one of the best defenses in the NFL. There is no more room for excuses. The Bengals can win the division, but can they finally show up in the post season? Also, head coach Marvin Lewis is in his 12th year with the Bengals and is 0-5 in the playoffs. How much time does he realistically have? Free Agency: The Browns seemed more interested in adding older veterans rather than keeping their own younger counterparts. WR’s Nate Burleson (Lions) & Miles Austin (Cowboys), LB Karlos Dansby (Cardinals) OT Paul McQuistan (Seahawks) SS Donte Whitner (49’ers) are all at the twilight of their careers. The additional signings the Browns made, are mostly viewed as back-up players. Draft: The Browns did make the draft payoff in a big way. Oklahoma State CB Justin Gilbert adds another big threat in the secondary. Then came the big trade-up to land coveted Texas A&M QB Johnny Manziel. Nevada OT Joel Bitonio was a great pick in the 2nd round & Iowa LB Christian Kirksey should be a versatile defensive player. Small college talent RB Terrance West (Towson) & CB Pierre Desir (Lindenwood) were the icing on the cake. Overview: Long time defensive coordinator Mike Pettine gets his first ever head coaching job, and what a job he has ahead of him. The Browns are facing a big dilemma. The fans will be yelling for Manziel to play immediately, but having him sit and learn would be the wise move. Losing defensive standouts T.J. Ward & D’Qwell Jackson and replacing them with aging veterans is a puzzler. Pettine is fortunate that this is his first year, then again Rob Chudzinski may have felt the same way last year. Free Agency: FS Mike Mitchell (Panthers) is a big addition for the secondary. However, WR’s Darrius Heyward-Bey (Colts) & Lance Moore (Saints), & RB LeGarrette Blount (Patriots) are a bit underwhelming for an offense that desperately needs weapons. Draft: Ohio State LB Ryan Shazier is fast. Now he needs the discipline to contain his aggressiveness. Notre Dame DE Stephon Tuitt is a strong 2nd round pick. Kent State RB Dri Archer will add speed & the other Clemson WR Martavis Bryant adds dependability. UCLA LB Jordan Zumwalt & Tennessee DT Daniel McCullers are solid late round picks. Overview: The Steelers once again find themselves in a state of flux. The imbalance on both offense and defense make it difficult to assess if they have really improved. The loss of several veteran players makes the offseason feel like a step sideways instead of forward. QB Ben Roethlisberger is not getting any younger, and if he were to get injured…..Yikes! If things do not improve for this team, don’t be surprised if head coach Mike Tomlin finds himself on the hot seat. 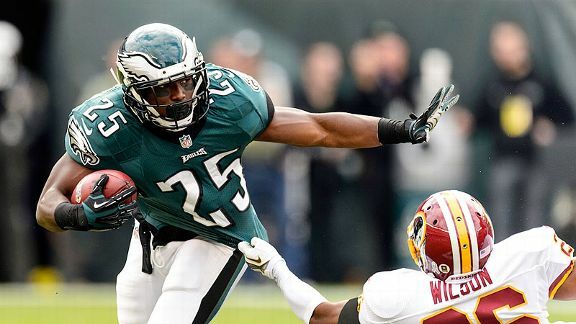 After leading the NFL in rushing yards this past season, LeSean McCoy was projected to be one of the top fantasy football running backs again in 2014; however, with the Philadelphia Eagles sending a fifth round draft pick to the New Orleans Saints to acquire speedster Darren Sproles, McCoy may not be able to gain as many yards as he did last season. McCoy had a phenomenal season in 2013 leading the NFL with 1,607 rushing yards, adding another 539 yards through the air, and finishing with 11 total touchdowns; however, the addition of Sproles might threaten some of these numbers. 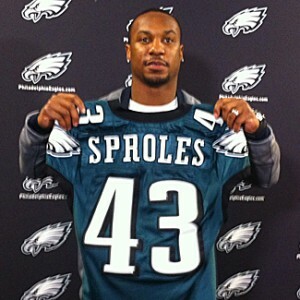 Sproles is an interesting player: he can be a running back, Wide Receiver, or return man and put up huge numbers in all three aspects of the game. Although Sean Payton preferred to put Sproles in motion and use him as a receiver in New Orleans, Eagles Head Coach Chip Kelly has already assured everyone that Sproles will be lining up in the backfield this season and that he will be a running back first and a receiver second. This could definitely impact how much McCoy sees the ball. McCoy’s large numbers last season were partially due to the amount of touches Kelly gave him: 314 rushing attempts and 52 receptions. However, you have nothing to worry about when it comes to McCoy; he is still projected to be a top five fantasy running back. The first thing to remember is that there is plenty of yardage to go around in Kelly’s explosive offense, especially with Desean Jackson leaving and signing with the Washington Redskins. Jackson’s absence will leave a lot of receiving yards to go around. Sproles is a great player, and Kelly will find plenty of uses for him besides rushing; so don’t expect McCoy to drop below 300 carries for the season. Sproles is most dangerous when he’s put into motion out of the backfield, so despite what Kelly is saying now Sproles will most likely end the season with more receptions than carries just as he did the past two seasons in New Orleans. If that’s the case, Sproles will at most take away a few receptions from McCoy; but McCoy should still see no less than 40 receptions this coming season. 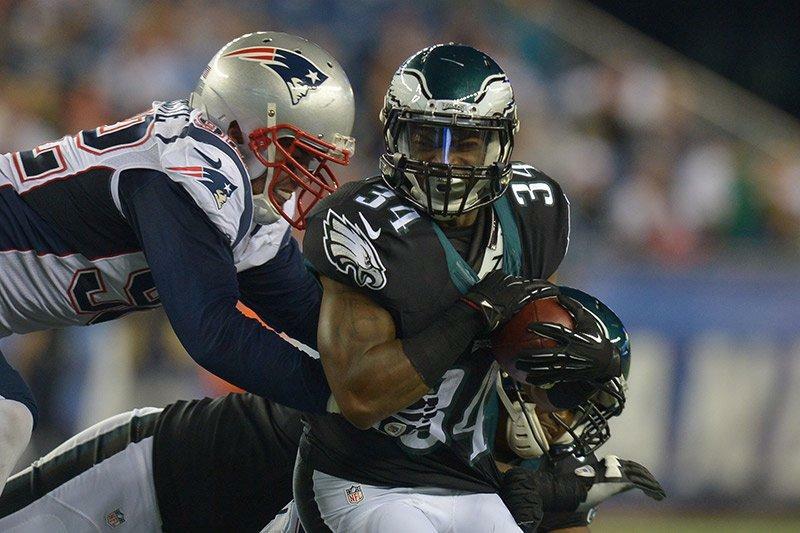 The main reason that McCoy is expected to maintain his high fantasy value in 2014 is Coach Kelly. In his first season as the Eagles Head Coach, Kelly turned the Eagles offense into a well-oiled machine. Kelly’s offense was one of the most efficient and effective in the league, and Sproles will only make an already explosive offense even more dynamic. 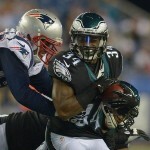 Kelly will no doubt find a way to utilize Sproles while preserving McCoy’s large role in the offense. Quarterback Nick Foles isn’t exactly a runner like Michael Vick was, so McCoy may have even more carries than last season despite losing some to Sproles. The area in which Sproles will most affect McCoy is touchdowns. Sproles’s presence in the backfield threatens to take away a few touchdowns from McCoy, both rushing and receiving; however, if McCoy can maintain the same level of productivity in the running game that he had last season, he’ll earn plenty of points for his fantasy owners through high yardage. McCoy will most likely finish fourth out of all fantasy running backs behind Adrian Peterson, Jamaal Charles, and Matt Forte. If you have a high first round draft pick in your league, I would recommend trying to grab one of these three; however, using a late first round pick on McCoy would not be a waste. Coach Kelly should have no problem finding a way to keep McCoy in the top five running backs in the NFL, but only time will tell how much of an impact Sproles will have on McCoy’s numbers in 2014.